My uncle, John C. Pickford, served in the RAF from 1941 until 1946. Between October 1944 and the end of the war in May 1945, he flew about fifty operations over Germany as a Navigator/Bomb Aimer in Mosquitoes. With the aid of his flight logs and entries in Operations Record books, over the coming months I will provide an insight into those operations and his war-time experiences in “The Wooden Wonder”. 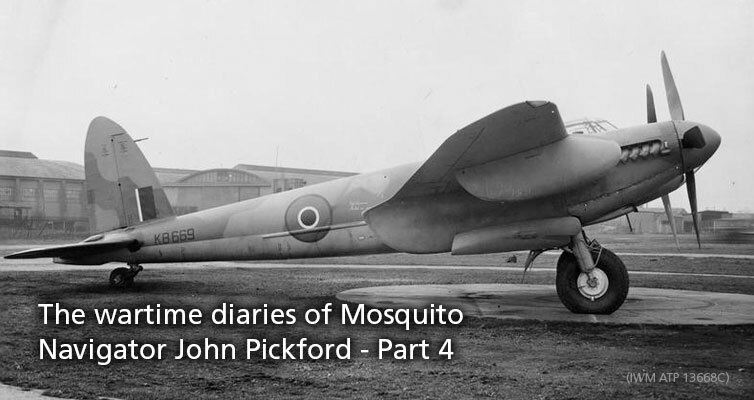 In this fourth instalment, I will cover his part in the raids which took place in January 1945, which was a very quiet month operationally due to prevailing bad weather conditions. The weather in January severely restricted operations for the Squadron. A limited number of crews were involved in operations on January 2nd, but bad weather cancelled operations on the 3rd. Despite snow showers, hail and thunder storms, twelve aircraft were involved in raids on Berlin on the 4th, with a further twelve involved in raids on the 5th. 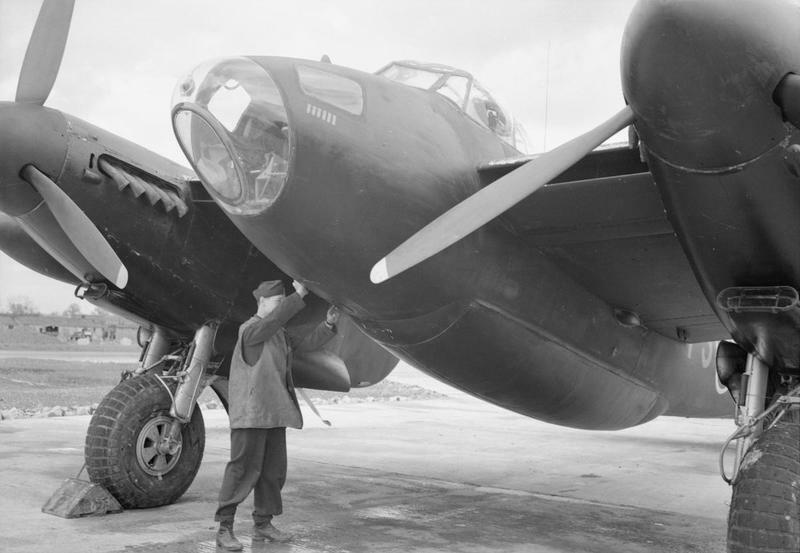 Three aircraft took part in a raid on Hannover, providing Early Window support to the main force of over 600 bombers. The remaining nine aircraft were part of a Light Night Strike Force (LNSF) raid on Berlin. This raid was marred by the crash of one of the aircraft on the approach to Gransden Lodge. Strong headwinds on the return leg meant that many of the aircraft had been in the air for almost 5½ hours and were running low on fuel. KB397-P, flown by F/L Bohuslav Eichler (a Czech) and Sgt. “Jock” Logie ran out of fuel on their final approach to the airfield and crashed in the grounds of Hateley Park, about 3 miles from Gransden Lodge. Despite the fact that the aircraft did not catch fire, both crew members died in the crash. Further raids took place on January 6th, with eight aircraft involved in a raid on Kassel. 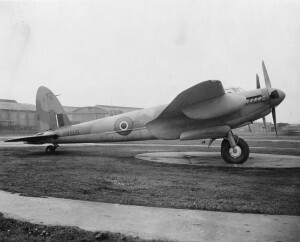 A further four aircraft were called on to provide Early Window support for a larger raid on Hannover, but this was cancelled after the crews had been briefed. Despite snow showers on the 7th, three aircraft were detailed to provide Early Window support for a large raid on Munich, with a further eight aircraft taking part in a LNSF raid on Hannover. John returned from what was quite a long break and during the day on January 8th he got in a short low level practice and night flying training flight with S/L Basil Jones in KB450-E. That was the only flying for John for almost three weeks, as the weather closed in during the day, and heavy snow showers prevented any further operations. This weather continued for another five days, and it was not until January 14th that any operational flying was possible. On that day, John accompanied Basil in KB435-C on a night flying training and low level flight, which included a practice bombing run. That was probably well needed after such a long break from operations. That night, Basil and John took the same aircraft on a raid to the Leuna synthetic oil plant at Merseburg, which had previously been the subject of repeated, largely unsuccessful attacks by the USAAF. Indeed, between May and December 1944, the 8th Air Force attacked the plant 18 times, with the loss of over 150 aircraft, nearly all of which were B17s . Along with F/L Barnes and F/L Jenkins in KB432-M, they were dispatched on an Early Window operation, whilst a further twelve of the squadron’s aircraft were involved in a two wave attack on Berlin. The first wave of six aircraft took off for Berlin around 17:40, with the second wave leaving soon after the two aircraft involved in the Merseberg operation took off, shortly before 21:00. The weather over the target was low cloud. As they approached the target, John and Basil saw two stationary searchlights illuminating the cloud. They dropped their four 500lb bombs on these searchlights from a height of 23,000 ft at 23:51. They saw the red TIs (Target Indicators) fall in a good concentration to the south of the searchlights and reported that all of the bombing was on the TIs. 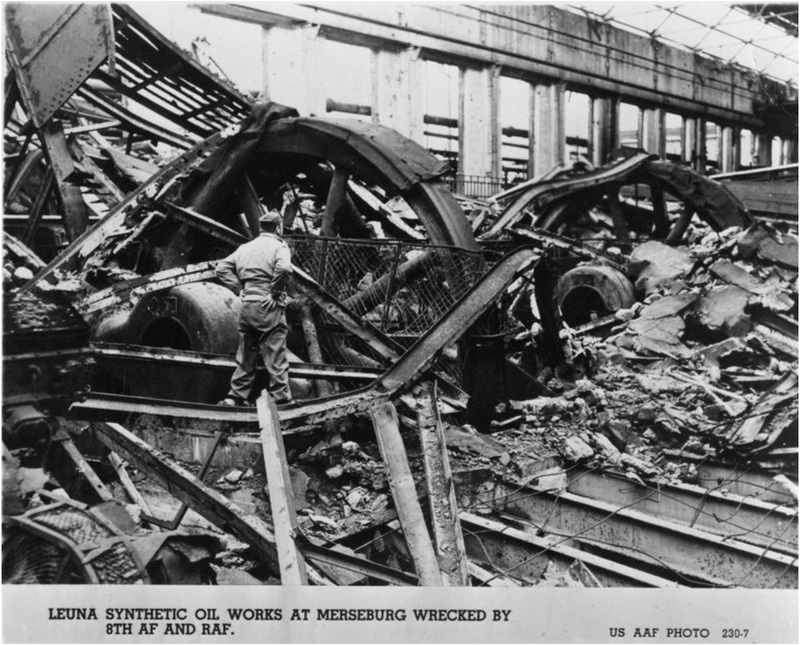 Indeed, the attack was one of the most successful on the plant, halting production until after the war. They also reported intense flak, which was as predicted, especially as they left the target. 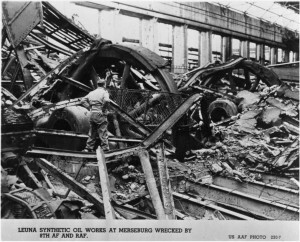 The Leuna plant was the most heavily defended industrial plant in Europe, with a reported 400 anti-aircraft guns protecting it. This was twice the number that were protecting Berlin, and was an indication as to how vital this plant was to producing the fuel that Hitler needed to keep his war machine running. Basil and John returned safely to Gransden Lodge after the raid, landing at 01:37. F/L Barnes and F/L Jenkins were less fortunate. Having successfully dropped their bombs on ETA, and reporting seeing a large glow from the fires on the clouds below them, they were forced to shut down their port engine due to a suspected burst oil cooler. Flying on one engine meant that the flight back took longer than expected, and the crew landed safely at Woodbridge at 02:23. 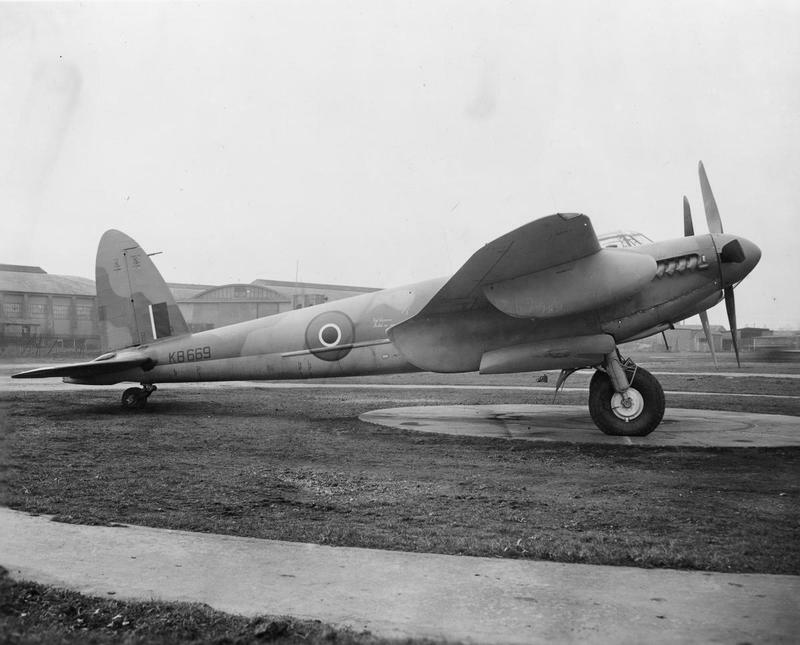 The aircraft remained at Woodbridge for repairs and was returned to operation with 142 Squadron at Gransden Lodge on January 21st. Weather conditions on January 15th were good enough during the day to allow Basil and John to get in a 90 minute low level practice flight, with four bombs being used for a low level bombing practice. However, poor weather over Germany meant that the planned operations for that night were cancelled. 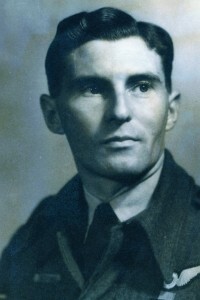 Although the squadron’s aircraft were involved in raids to Mannheim on the evening of the 17th, Magdeburg in the early hours of the 18th and Stekrade on the night of 18th/19th, John did not fly again until January 21st, when he flew with S/L Siminson in KB436-A on a 50 minute aircraft handling check with a full bomb load. That was to be John’s last operational flight of the month, and, with Basil Jones leaving the squadron on January 23rd to take command of 692 Squadron at Graveley, it also meant that John would be teaming up with a new pilot when he returned to action in February. The squadron did continue with a limited number of operations during the rest of January. There was a raid to Kassell on the evening of January 21st, and raids on the Benzol plant at Duisburg and on Hannover on the 22nd before the weather worsened again. Snow on the 23rd meant that operations that day were cancelled and the squadron was stood down on the 24th. The wintry weather continued until the 28th, when the squadron’s aircraft took part in raids on Berlin and Stuttgart. A further raid to Berlin took place on the 29th, but on the return from this raid, the crews were diverted to Woodbridge because of dense fog. The crews were able to return to Gransden Lodge with their aircraft the following afternoon, but the weather closed in again and there was no further operational flying for the month. By contrast, the weather in February was much better, with John involved in ten operations. These will be described in the Part 5 of his wartime diaries. Part 5 of John’s diary will be posted soon. Have you visited the TPM shop or our eBay shop yet? Profits from sales go directly towards returning a UK based Mosquito to flight. If you wish to donate directly to the project, please visit our Donate page.